What made me want to try Argument? Two things: I liked the name, and I heard they had really nice lamb chops. Sometimes, that's all it takes. We went for an early dinner. 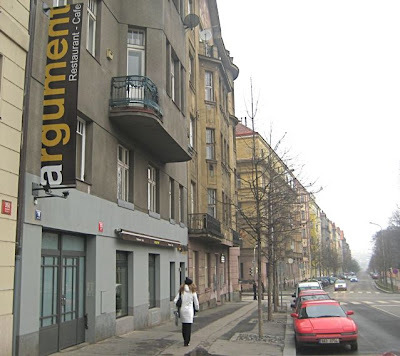 The restaurant was only about a five minute walk from the Hradčanská metro station. The interior reminded me of my grandmother's place. That was actually a good thing. My grandmother was a very stylish, Dutch-born woman, who surrounded herself with modern art, bright colors, and clean lines. The banquettes looked just like my Oma's couches. She liked orange chairs, too, but maybe that's a Dutch thing. I felt very at home in this restaurant. That's said, this style can be polarizing. V thought the fabrics were too bright and rough. The waitress brought out bread. They charge 20 CZK for that. It was cold baguette slices, no butter or olive oil. 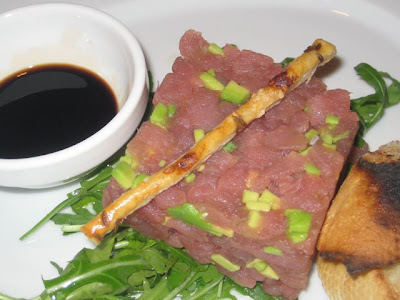 For a starter, I had the tuna tartare (160 CZK). It was shaped into a cube and was a generous amount for the price. There were bits of avocado mixed in, but unfortunately, they were not ripe. The tuna itself was fairly salty and didn't need the extra soy sauce on the side. I didn't like it so much at the beginning. But then I discovered that the rucola underneath had a very sweet dressing. When the salad and tuna were combined on the fork, the flavor balanced out, and I enjoyed it. 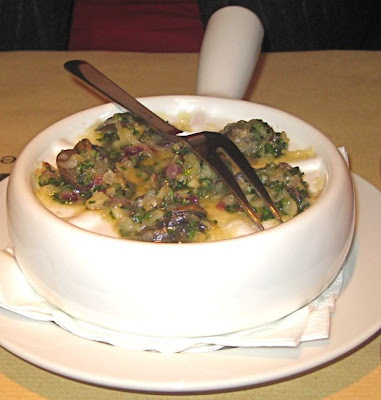 V had the Burgundy snails (135 CZK). Six of them were covered with plenty of butter and garlic. The snails themselves were OK, but didn't impress. They had more of that garden flavor than those you'd find at Cafe Savoy, her favorite snail source. 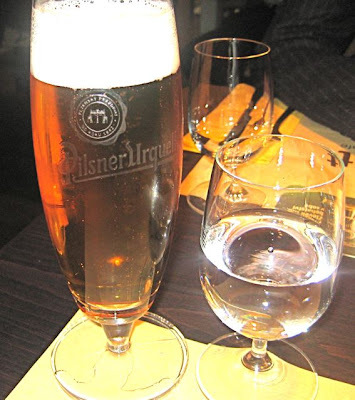 I had a .3 liter glass of Pilsner Urquell (38 CZK each). V had a couple of Mattoni mineral waters (35 CZK) and a shot of Jägermeister (55 CZK). Yeah, I thought it was an odd choice, but she said she had a taste for it. To me, it tastes like medicine. 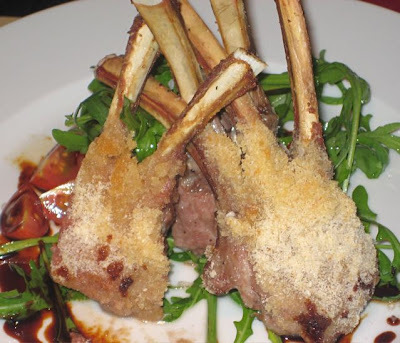 For a main course, I gave V the honor of ordering the lamb chops in a honey crust (355 CZK). They were all I'd hoped and dreamed. There were two double chops and one triple on the plate. They were cooked perfectly as requested, medium rare. They were oh so tender. 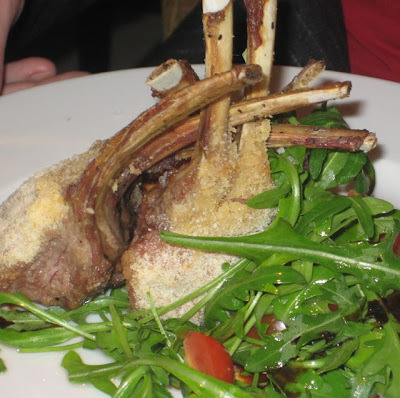 The delicate lamb sat on a lovely sauce that tasted of plums and wine, but we weren't exactly sure of its composition. We wished there was more sauce. We wiped the plate clean. There was also rucola with cherry tomatoes. Even the crust was just right. I can easily imagine a big name restaurant in the center charging double the price. I was in the mood for a steak. The menu has them divided by tenderloin versions, called svíčková, or a more ordinary cut called roštěná. 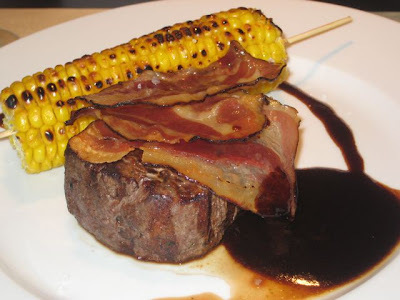 I went for the beef tenderloin, topped with bacon, and a thyme demi-glace. (360 CZK). There was grilled corn on the side. I got a separate order of fries to go with it (45 CZK). I asked for some ketchup and was surprised when they told me they had none in the restaurant. 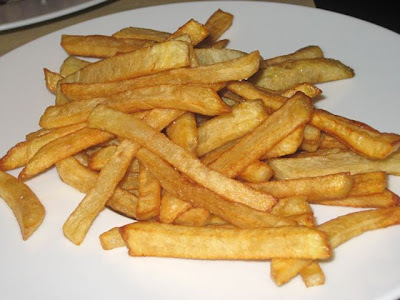 I was even more surprised when I tasted the house-made frites and discovered they were the best I'd had in a long time. They were terrific all by themselves, which is pretty rare in my book. However, the steak itself was disappointing. It wasn't bad, just very unremarkable. It wasn't tough, but not too tender. 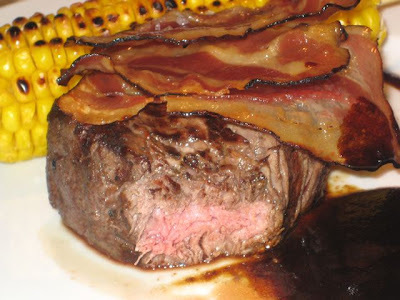 They did cook it to my requested medium-rare. There was no stand out flavor. The demi-glace was dominated by too much salt, with the other flavors hiding too far in the background. 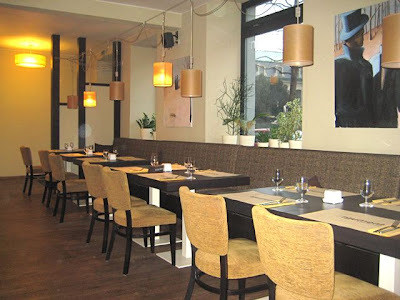 I'm sorry to invoke Cafe Savoy again, but they used to do a demi-glace for their entrecote that inspired love in my heart. They don't make it anymore, and this one didn't come close to requiting that lost love. The bacon on top was a total disaster. I'm not sure how they cooked it, but it had the consistency of plastic. It was like eating a smoked credit card. On the plus side, the grilled corn was good. We enjoyed passing it back and forth to nibble on the niblets. 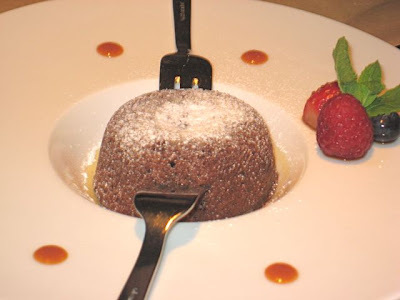 We ordered the chocolate fondant for dessert (95 CZK). It was pretty average and could have used a more intense chocolate. Don't get me wrong -- even an average fondant is still enjoyable for me. But it didn't impress like the one at Buddha Bar or Maze (R.I.P.). I should add that the menu says it comes with ice cream, the receipt mentions ice cream, but when you examine the photo, you will not see ice cream. We weren't in a complaining mood, so we let it slide. 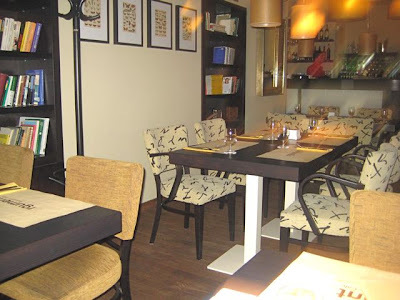 The bill came to 1371 CZK. Not a cheap dinner. And for that money, I wouldn't go out of my way to go back for most of it. However, I'm the type of person who can fall in love with one dish, become obsessed with it, and have to go back just for that. And that's what those little lamb chops have done to me. I'd argue, as I often do about restaurants, that Argument is worth trying just for those alone. I'd even recommend them to my remaining friends. Well I love a good argument and a decent lamb chop. Thanks for the tip!